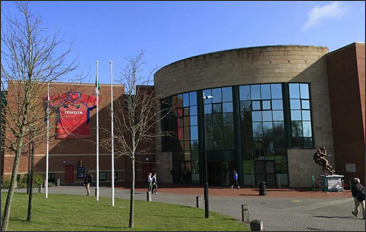 The University of Limerick (UL) was founded in 1972 and was the first university established since the foundation of the Republic of Ireland in 1922. UL is located on the River Shannon, on 80 hectares (200 acres), inside the National Technological Park at Castletroy, and 5 km from Limerick city centre. The university currently has over 11,000 full-time undergrads, 1,500 part-time students, and 2,100 postgraduates. UL offers an exceptional student experience and has the largest work placement program of any university in Ireland, with a network of over 1700 employers. "One of the reasons I picked UL was because it was one of the highest rated research universities in Europe and their Psych department is amazing. I would definitely recommend this program, let alone, studying abroad, in general, to students! I feel like it’s just something all students should take advantage of. You’re able to escape your comfort zone, try new things, live in a different environment, make international friends, and so much more. It was truly a wonderful experience and I’m glad I was able to take on this adventure." "I would recommend this program to absolutely everyone currently attending UMass. The Irish are so welcoming and friendly. I really felt like Ireland became an instant second home to me. Attending UL and living in Ireland has truly changed aspects of myself both as a person, a student, and a future businesswoman. Traveling feeds the soul and breaks down the wall of judgment and fear. Talking, listening and hearing other peoples’ opinions, fears, philosophies, jokes, and desires makes you a better person." Why study at UL? Find out in this video published by the University of Limerick! Colleges include Business, Education, Engineering, Health Science, Science, and Arts, Humanities, and Social Science. Programs of particular strength are Engineering, Computer Science, Equine Science and Sports Science (available to majors only). UL also has a host of Irish scholars specializing in Irish history, literature, arts, culture, politics and Irish language. Students are allowed to take classes across the curriculum if prerequisites are met. Please scroll down to "Course Transfers Reference Table" to see how courses from UL transferred to UMB. Available in 4 departments: Irish Studies, Business, Architecture, and Nursing. For more information and course options, see the 2017 Brochure. University of Massachusetts students only. Undergraduate, graduate, and post graduate students who have currently completed at least one year of full-time study with the most recent semester completed at UMass Boston are eligible. Students must be in good academic standing (at least 2.75 GPA) with no disciplinary problems. No language requirement is necessary. Students can choose to live on campus in one of the six student villages or off campus in private student accommodation or self-catering houses and apartments. Students with a U.S. passport do not need to obtain a visa to enter or study in Ireland. For students who are not U.S. citizens, please visit the Irish Naturalisation and Immigration Service website. This is a UMass Boston Reciprocal Exchange Program. There are two separate applications. First, students apply to the program by completing this online UMass Boston application. If eligible to study abroad, the UMass Boston Study Abroad Office nominates the student to the university abroad. The student is then informed with a letter or an email about next steps to complete the university's abroad application. The Spring 2018 online application is open. AFTER nomination, please download the UNIVERSITY OF LIMERICK SPRING 2018 APPLICATION INSTRUCTIONS.pdf. Once nominated by our office to UL, please apply here: https://www.si.ul.ie/urd/sits.urd/run/siw_ipp_lgn.login?process=siw_ipp_app&code1=EXOTUL1SBD&code2=0005 .